Whether you’re listening back to your latest home recording project, practising at home in blissful isolation, or relaxing with your favourite tunes, a great set of cans is an essential part of any musician’s arsenal. 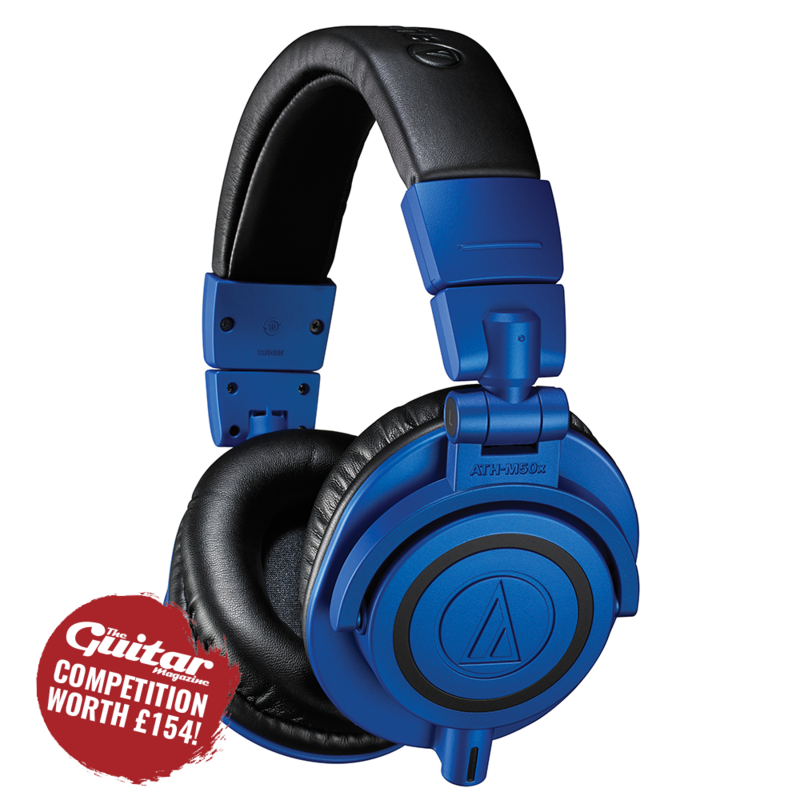 To make sure that you’re enjoying your music in all its forms, we’re giving one lucky The Guitar Magazine reader the chance to win some pro-quality Audio-Technica ATH-M50xBB headphones in a limited edition metallic blue finish. Audio-Technica has more than 50 years of experience in the high-end audio game, and as such the firm’s cans are relied upon by professional recording studios and star musicians the world over – including the likes of Metallica, James Bay, Royal Blood and many more. The ATH-M50xBB professional monitor headphones were released at Winter NAMM 2018, as a limited edition version of the popular ATH-M50x in this striking metallic blue-finish. As eye-catching as they are, however, the most important thing about the headphones is what’s going on inside, and there Audio-Technica has also got you covered. From the 45mm large-aperture drivers with rare earth magnets and copper-clad aluminium wire voice coil, to its sound-isolating earcups, the ATH-M50xBB set provides an unmatched audio experience for recording, live sound, practice and personal listening. The headphones also incorporate technology drawn from Audio-Technica’s long history in the field of pro audio, providing exceptional power handling, very high SPL capability, and natural, accurate sound with impactful bass and high-frequency extension. With their professional-grade earpad and headband material, and a collapsible design with detachable cable, the ATH-M50xBBs are also supremely comfortable and easy to transport. To find out more about Audio-Technica’s M-series headphones visit audio-technica.com, and to be in with a chance of winning a set for yourself, simply click here and answer the following question. Good luck! To be in with a chance of winning, simply submit your answer and details using the form above. By ticking the newsletter box you will be automatically be added to The Guitar Magazine email newsletter list, keeping you informed of news, special offers and promotions via email. Anthem Publishing will not pass on customer email addresses to other companies. You may unsubscribe from these messages at any time. The editors decision is final. The competition is open to UK residents only. Winners will be notified by email and will have five days to claim their prize before it is passed on to the runner-up. The full competition T&Cs can be found here on the Anthem Publishing website.Closing date 20th September 2018.